The great barrier to the expansion of settlement of the American continent was the ominous Rocky Mountains. We approached these monsters from the west and explored the alpine meadows where the lean Colorado River begins its mammoth journey. It was remarkable to think that this small gurgling stream that we could almost jump across would grow into the mighty river that cut the Grand Canyon. There was a fascinating wander through an old ‘dude ranch’, the beginning of the local tourist industry where, in the early 1900s, local ranchers realised they could make money by giving city slickers a true ‘outback’ experience. 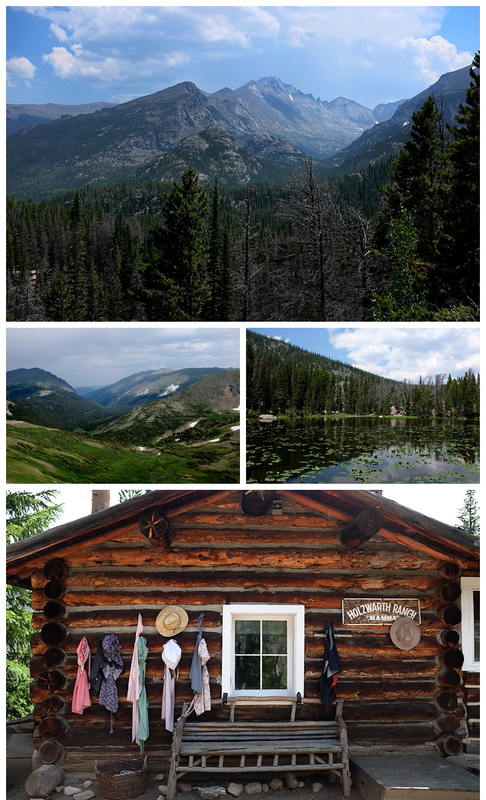 We followed the Trail Ridge Road over the top of the Rockies, up above the tree line and into the snowfields. 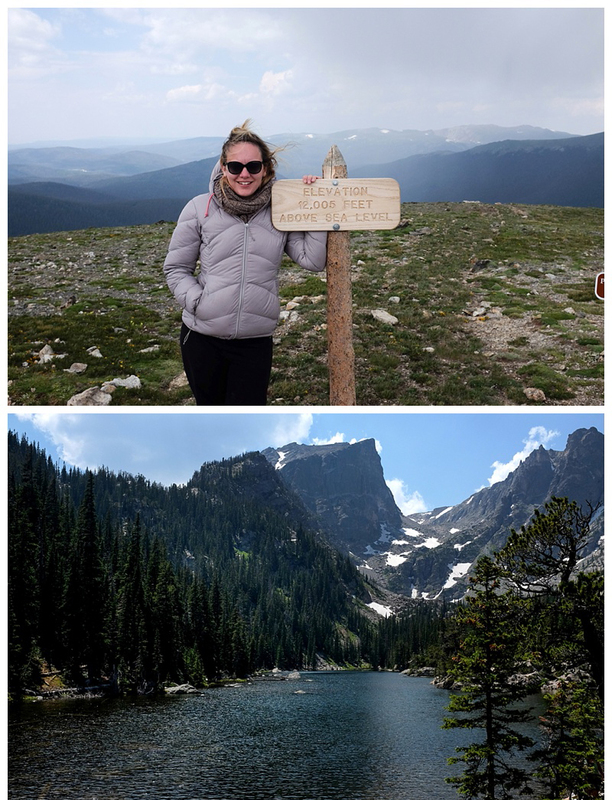 We crossed the continental divide, and peaked at over 12,000ft, where the panorama was spectacular. Avoiding afternoon thunderstorms (the week before two people had been killed by lightening in separate incidents on successive days), we bunkered down on the east side of the park. Next day we climbed into the mountains again to follow a spectacular trail taking in three very distinct mountain lakes. Next day we had to finally say goodbye to the mountains. 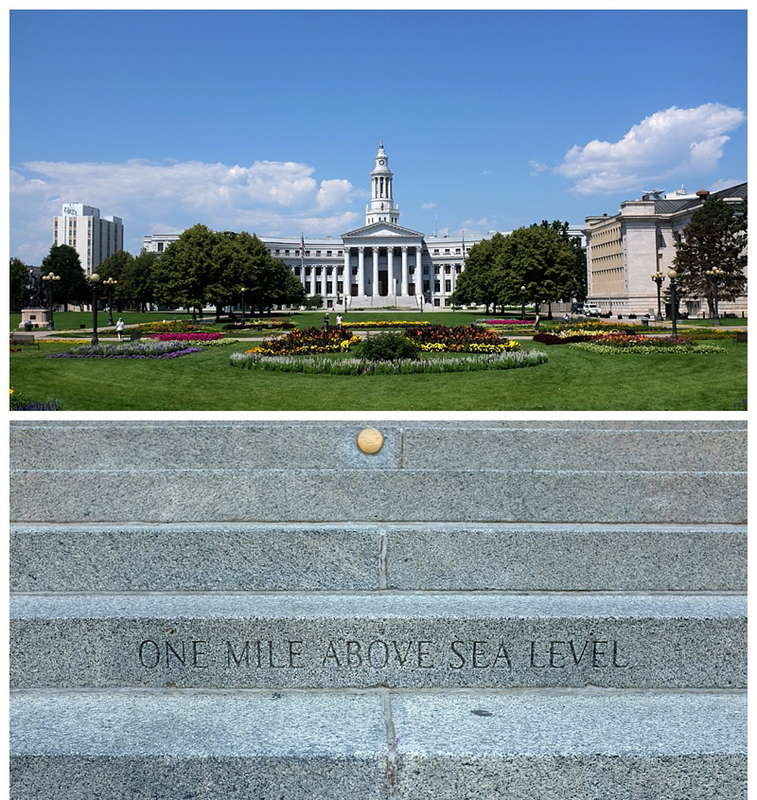 We dropped into Denver for an unplanned stop on a quiet but very hot Sunday afternoon. 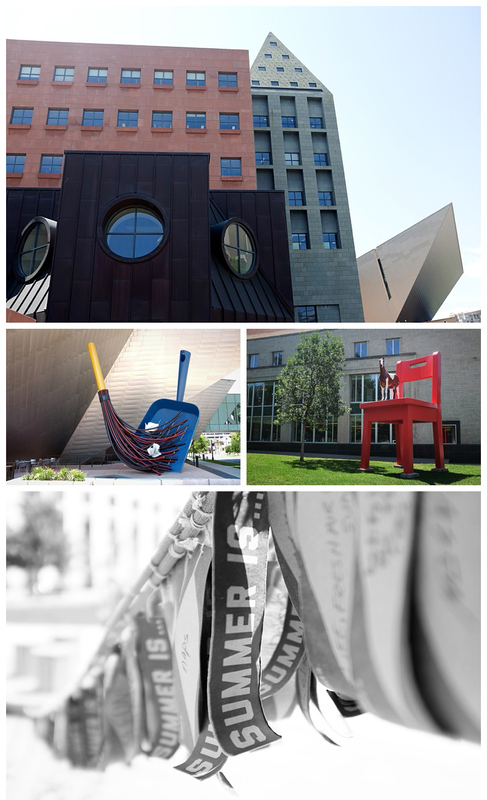 Part of the city, around the State Capitol, was fairly deserted, but we did discover some delightful art installations around the Art Museum. 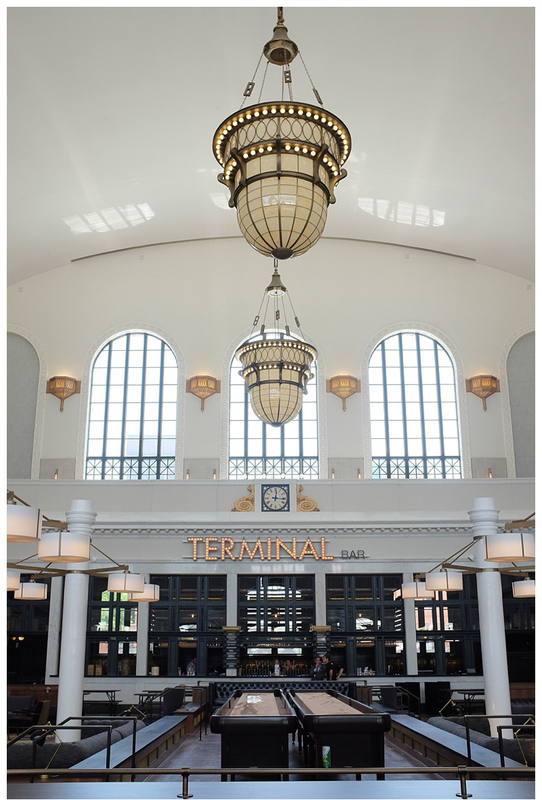 All the action of the city was along buzzing main strip running from the impressively refurbished Union Station. 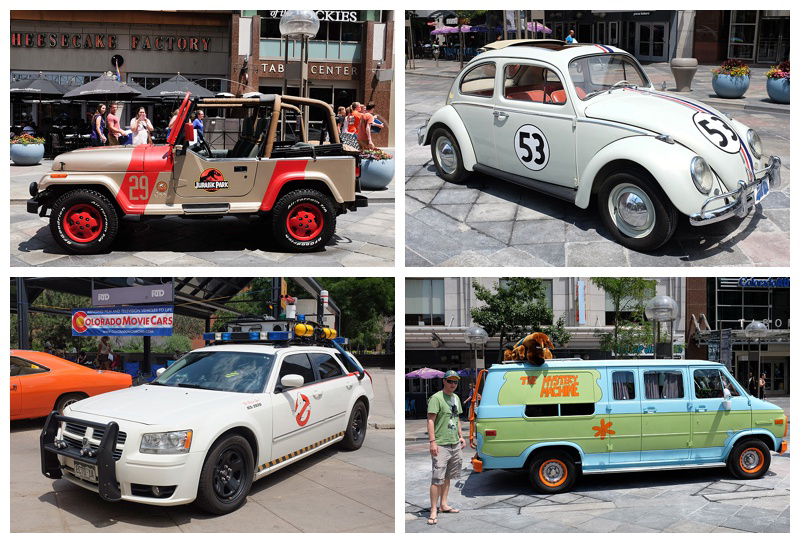 There was lots going on, including a huge mural being painted on the street, and a display of replica classic TV and movie cars – the Dukes of Hazard, Ghostbusters, Transformers etc. Out of Denver we headed back north, on a long drive through our first really flat countryside since New Mexico. 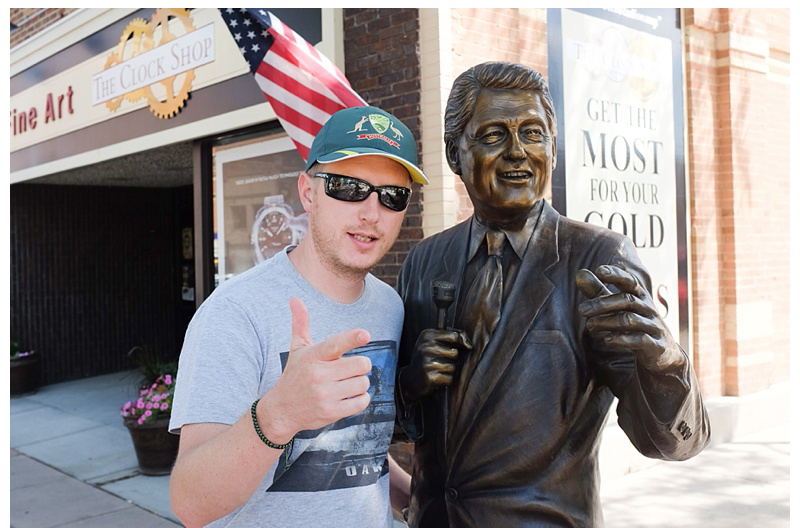 We hit South Dakota, and an eclectic group of sights and sounds. 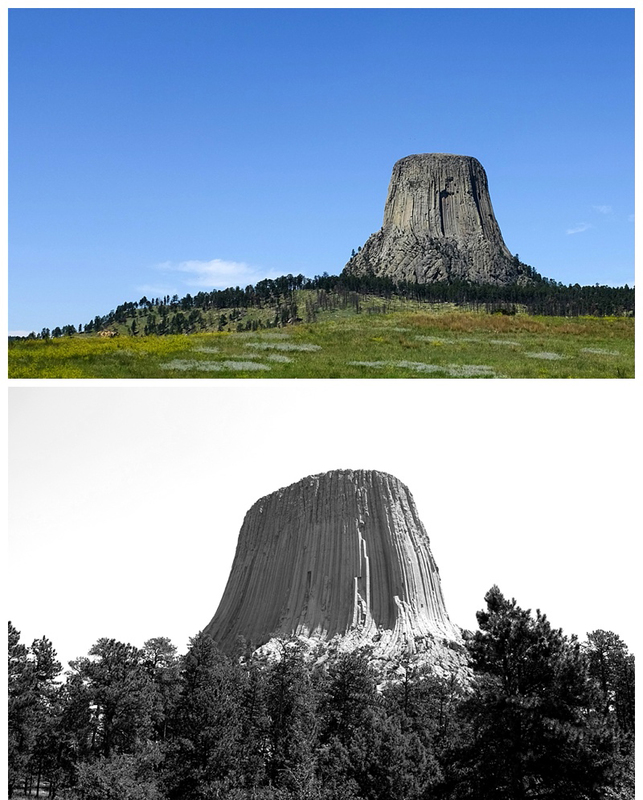 First up was the Devil’s Tower (OK, technically we were back in Wyoming, but SD was just around the corner), a bizarre rock formation sitting in the middle of otherwise pleasantly normal rolling hills. Probably created by leftover volcanic magma, the strikingly striped edifice rises nearly 400m above the surrounding ground, and is frankly pretty odd. Understandable that it has great significance to the local native peoples, and why it got the appellation from settlers it now has. The Devil probably had more influence in Deadwood, a lawless mining town made famous by the excellent TV series. After a period of decline the local powers legalised gambling, and used the substantial revenue to refurb the town to its late 19th Century look. Today it is a little gimmicky, but very popular. 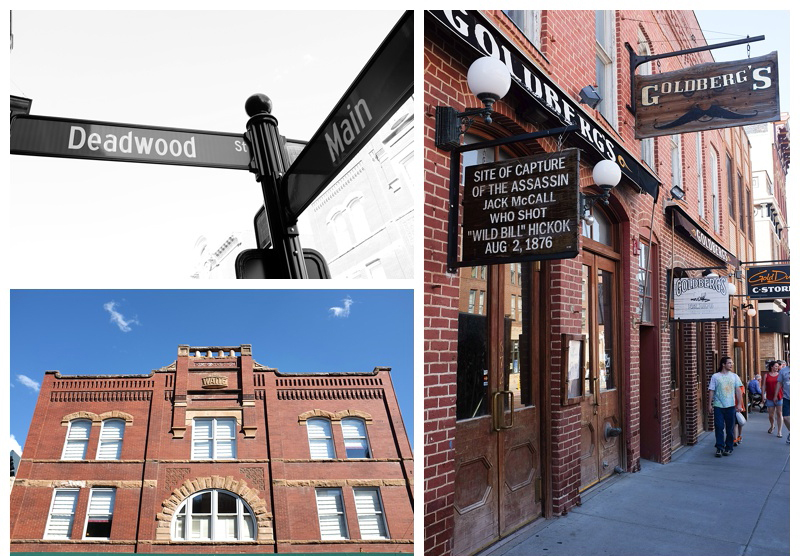 It’s most notable as the place where Wild Bill Hickok was shot in the back while playing poker in a dingy saloon. We watched a humorous (if slightly camp) re-enactment in what may or may not have been the exact spot. The scenery on the next portion of our trip – Spearfish canyon, the Black Hills and the Custer Scenic Byway – was lovely. We travelled through beautiful forests and winding hills, along dirt roads and peaceful lakes. It is a really underrated part of the country. Not completely devoid of tourists however, because down the road over 2 million of them make a small otherwise non-descript mountain into one of the most visited attractions in the country – Mount Rushmore. Now I’m going to be a bit controversial here. 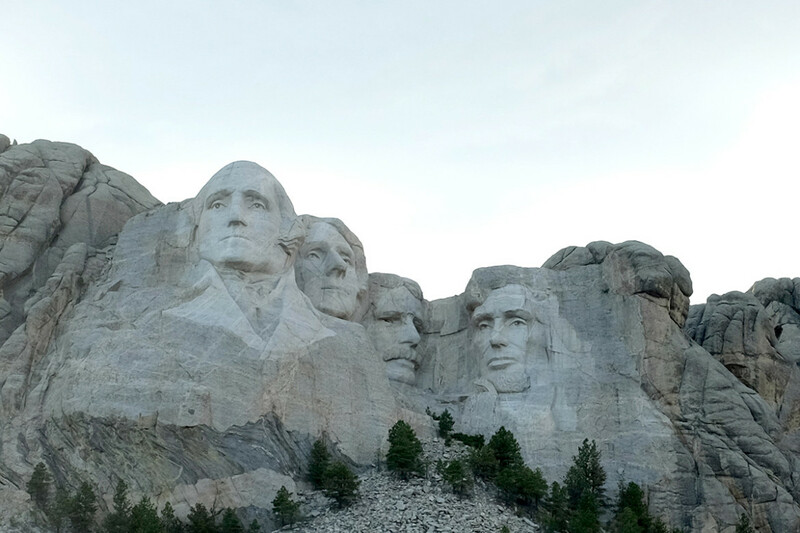 To me Mt Rushmore, with its large stony heads of four early US Presidents carved (actually dynamited) into the face of an innocent mountain, represents an unsettling view of how America sees itself. It was a strange experience to see the disfigured mountain, but the really curious thing was the way the site has been turned into some kind of odd monument to everything that America thinks it stands for, while – it seems to me – being based on such a fundamental misunderstanding of its own history. You can avoid seeing the thing in real life and just go as far as the coke machine in the car park if you like. There are columns and flags of each State in the Union through which you have to negotiate before reaching the main viewing plaza. Tucked away downstairs is a museum that explains why Washington (Father of the Nation), Lincoln (freed the slaves), Jefferson (the Louisiana purchase) and Roosevelt (conservation) were chosen to be commemorated in this way. I could go on and on about the inherent ironies of blasting into a mountain the face of the first President to take conservation and the beauty of the continent seriously. Or the flaws in each justification of choosing the other three Presidents to celebrate. 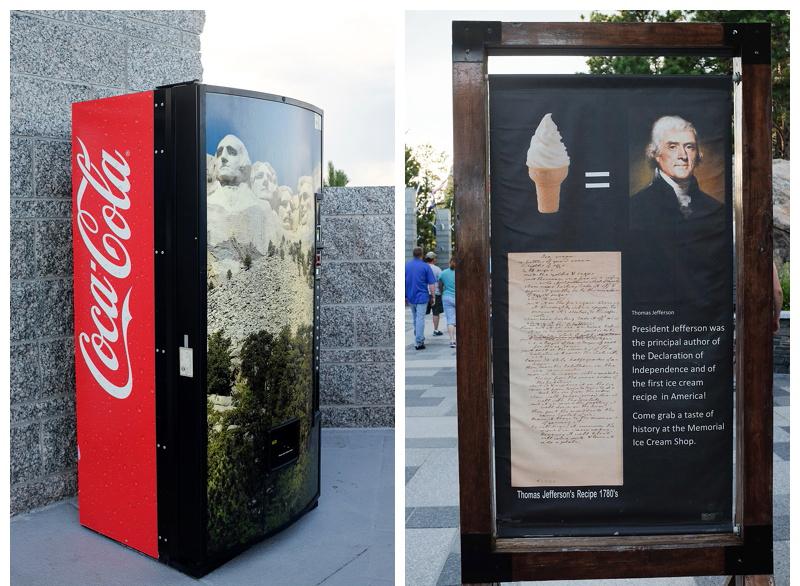 All of this is buried at Rushmore by a patriotic fervour. It culminates each night in a show where a lecture on the strength of the Constitution and the American destiny to be the leader of the Free World is followed by a patriotic film, and a stirring rendition of the National Anthem. And then, good Lord, they invite every member of the audience who has ever served in the armed forces to come up, individually salute the flag, and state their name and branch of service, before being wildly cheered by an ecstatic crowd. For ages. I think I was probably the only person there who found the whole naively arrogant patriotism slightly distasteful. But, and to America’s credit, this is the first display of this kind of thing (beyond a few bumper stickers and t-shirts) that we have seen here (perhaps the actual opposite of some of our preconceptions) which is why it stuck out so sorely . An aspect that is conveniently glossed over at Rushmore is the fact that it is on Native American Indian land. Not just originally native land, but land given as a reservation to local tribes by white men as recently as 1868, before being taken back ten years later. There is a long inglorious history of resistance to the requisition of native land. One of the leaders was Chief Crazy Horse, a Lakota Indian who was allegedly stabbed in the back under a white flag of truce at a US Army camp in 1877. As a direct response to Mt Rushmore, local tribes started a massive project to carve Crazy Horse into a mountain. Serene on a horse, pointing westward towards, as Crazy Horse himself said, “my lands… where my dead lie buried”. The project will be many times larger and more impressive than Rushmore. But what makes it so surreal is that it was tasked to just one man and his family, and offers of federal funding were rejected. The project has been underway since 1948 (!) and shows no sign of being completed. It’s not even 10% complete. To be fair, the extensive visitor’s centre is very interesting and houses local tribes-people creating and selling local crafts on site, as well as a small indigenous university and the museum background you’d expect from a place. 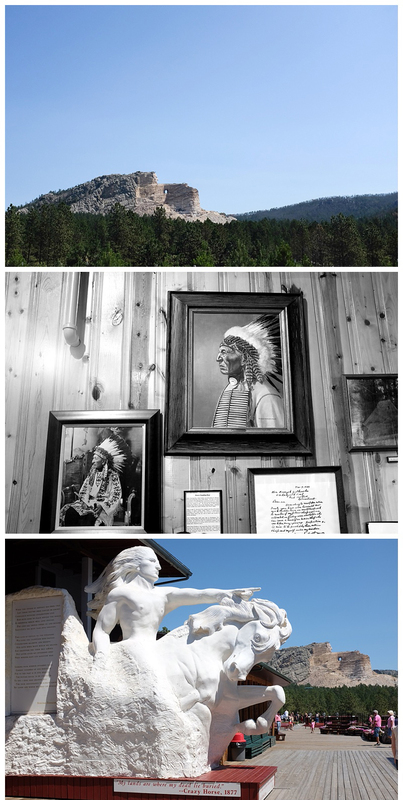 Juxtaposed next to Rushmore, the Crazy Horse Memorial is a sobering, depressing, yet hopeful place – a suitable antidote to the misapplied patriotism of Rushmore. 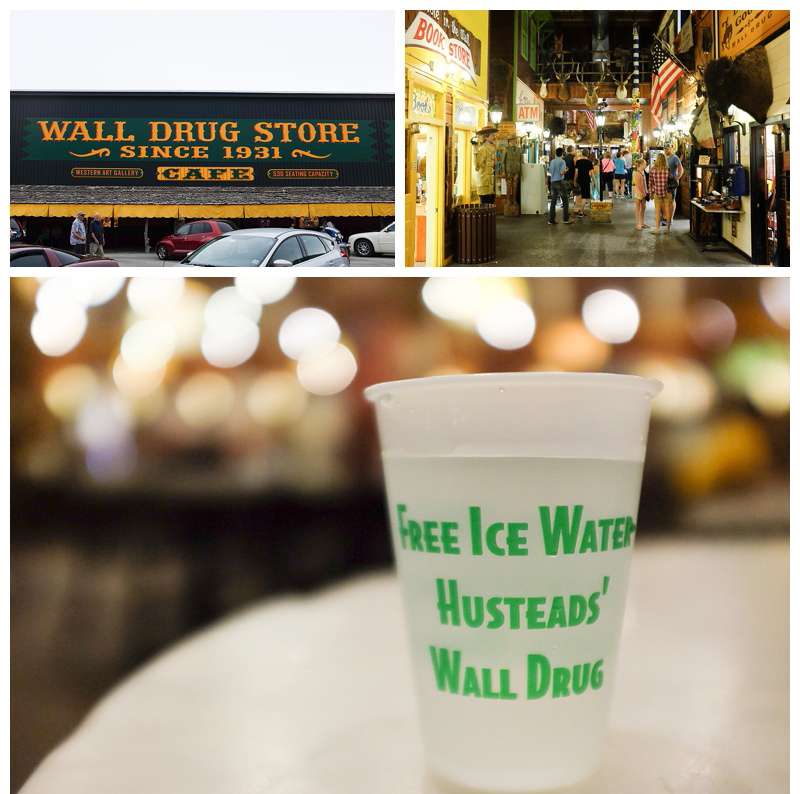 Our tour of diverse South Dakota continued with a brief stop at Wall Drug. In the 1930s a struggling drug store put signs on the nearby desert highway to encourage travellers to detour from the heat into the otherwise small non-descript town with the promise of free iced-water. One sign became hundreds, Wall Drug grew into a huge tourist attraction in its own right with a mish-mash of different kitsch stores, tacky attractions and average restaurants under one roof, and today you can find enigmatic signs and stickers saying things like “Where the heck is Wall Drug?” all around the world. In a few months there will be a new one in Melbourne. And they still give out free iced-water – over 20,000 glasses a year. South Dakota was (and to an extent still is) home to a secret US arsenal of buried nuclear missile silos, primed and ready to engage the Soviet Union at very short notice. We had a very quick look at a museum dedicated to these ‘Minutemen’ missile silos. It was weird and slightly unnerving to think that we had unknowingly driven past many miles of these hidden deterrents. 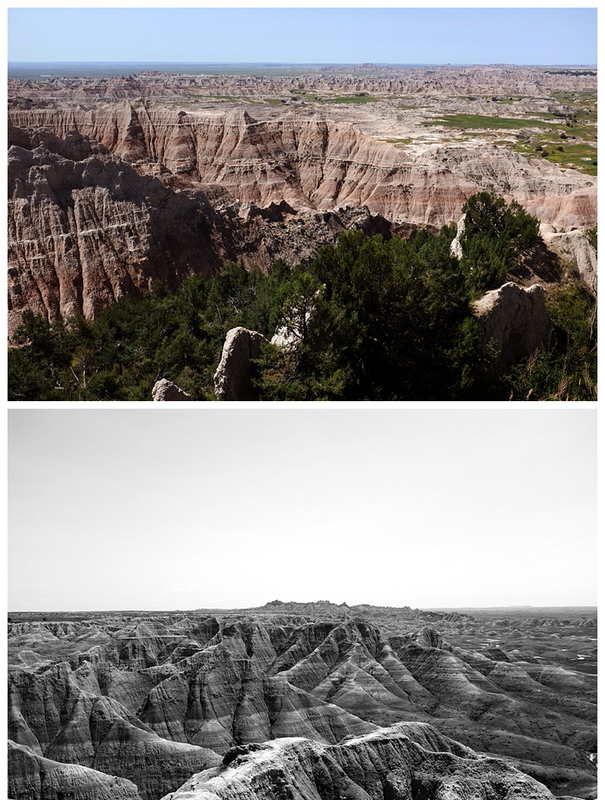 Other adventures followed in Badlands National park, where the scenery was not as engaging as some we had seen in the past few weeks, but still had a generous helping of prairie grass lands and Bryce Canyon-like eroded rocks and buttes. 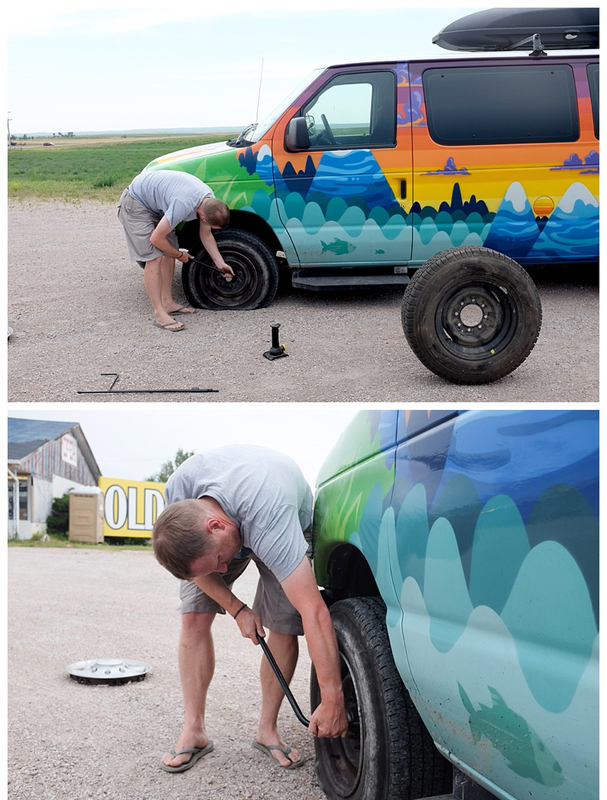 One puncture and tyre change later, and we hit the road for the long drag to the larger cities of the mid-west. Native American Chief Red Cloud. Hey guys… you stated my sentiments exactly regarding both Mt.Rushmore and Crazy Horse Memorial. 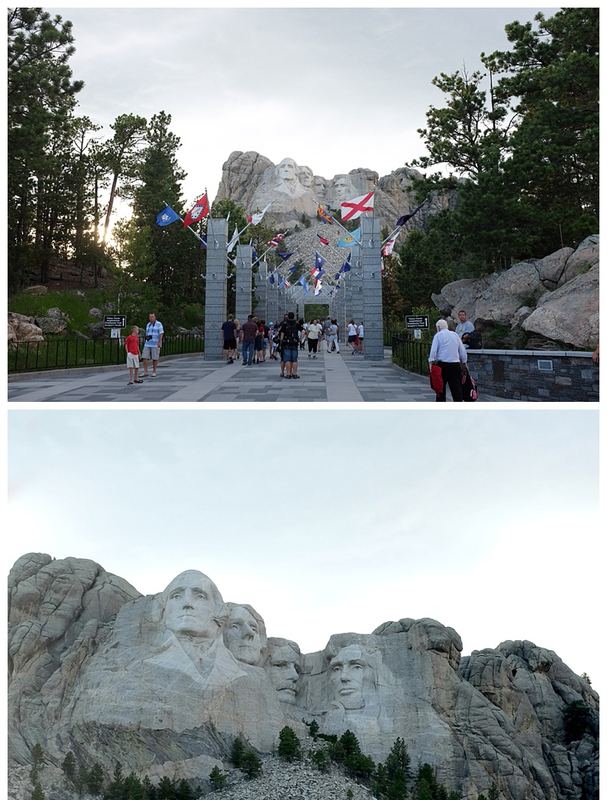 I had no inclination to see Mt.Rushmore for every reason you described; however, I realized I was going to drive right past it and figured why not stop? I am glad that the stop was followed by my visit to Crazy Horse – it felt somewhat redemptive to say the least. Also – I cannot wait to read more of your travels and journey. I wish I was still on the road myself! Hello 😀 What an amazing blog you have created! Your photos are beautiful Kirralee and Dave your writings are really interesting and thought provoking. I hope you go on to publish a book together.